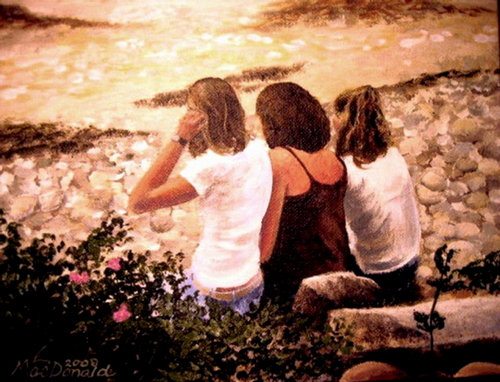 The three blossoms in the painting are my two nieces, and my daughter in the middle. (How apt to find three lovely roses blooming to their left.) We were enjoying a day in Rockport, MA and after a lot of walking, we took a break to rest on Back Beach. I remember the conversation the girls were having about "the lucky people who get to live by the ocean". 4 years later, as it turns out, my daughter moved to Cape Ann, rented for a while, and later purchased a home in Gloucester. Now my daughter is, as they mused that day, one of "the lucky people".